The Holidays are almost here, and I have decided to switch up from my regular thoughts on the Sens. I am focusing on ranking teams 1-31 on how likely it is they win the Stanley Cup. “Technically” speaking no teams are eliminated from playoff contention yet. So for this I will rank all 16 teams from the East. A team that has just been awful. Poor Jack Eichel. Not taken first, has to go to Buffalo, and has almost no teammates around him. At least Evander Kane looks like good trade bait. I would be shocked to see these guys make playoffs. A cup definitely isn’t happening this season. Turns out getting rid of all scoring depth, including a 30 and 15 goal scorer for nothing is a bad idea. “Thank God” Tallon is back though, right? This team is just so underwhelming; a team expected to miss the playoffs, and probably will. Their possession stats are average, and they have a little talent at least. Expect that playoff drought to go one more year. This hurts me to write, but Ottawa has hurt their chances at a playoff run… A LOT. Now, when you have Erik Karlsson on your team anything is possible. They also play in the disaster that is the Atlantic division. So there is some hope that they can sneak in. However, a return to the ECF seems very out of reach. I could have probably put these guys lower, but I honestly don’t think a team with Karlsson, Mike Hoffman, Mark Stone, and Matt Duchene are worse than the first 3. It is almost amazing that a team who already lost 10 in a row just 30 games in is actually this high. But the Flyers are a solid team, and got super unlucky. They are still somehow on pace for 87 points, and only a -2 goal differential. 5 of the losses in the 10 game skid were in OT or SO. Love those 3 point games. Unfortunately for the Flyers, they play in the best division in hockey. I think Philly will have to wait at least another year for playoff hockey. Now this is the toughest decision so far. The Devils somehow currently sit 2nd in the Metro at time of writing this. Does anyone really believe they are for real? It is pretty obvious they won’t be fighting for a lottery spot, but top of the metro is way overreaching. They currently sit 27th in CF% with a 103.5 PDO. Some regression should be due for these guys. The Metro division may just be the best in hockey, so a team like the Devils may find themselves fighting for a WC spot, but have a very tough road if they wish to see a cup this year. This team is the opposite of the Devils. Currently outside of the playoffs by 4 points the Hurricanes have been one of the best possession and shot teams. They rank 1st in CF%, and it’s amazing more pucks haven’t gone in. This team lacks a few great finishers that could make them deadly, and Scott Darling hasn’t been the greatest for them. If they get some solid goaltending they could find themselves at least competing for a playoff spot. However, a Cup this year looks out of reach. I debated throwing this team in the last tier. They are due for some regression as well. Sitting at 29th in CF%, 3rd in the Metro seems high for the Rangers. 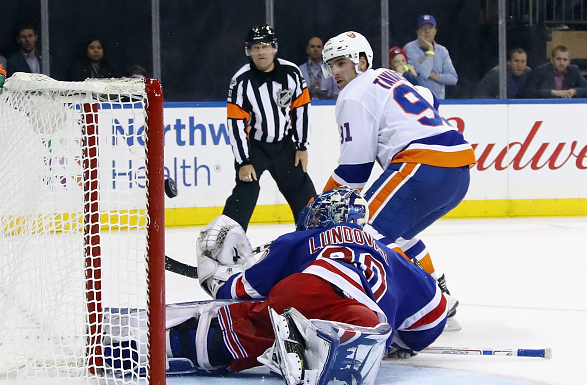 However, with Henrik Lundqvist in the net anything is possible. He’s aging, but still playing well. He’s sitting at a .922 in 5v5SV%, which is about 5% higher than he is supposed to be. The team is meh, but Lundqvist is awesome, and I would at least expect this team to be close. A Cup seems somewhat out of reach, but as said before, make the playoffs and anything can happen. The Islanders currently sit in the 2nd Wild Card spot and are an average possession team. They look much better than I would have expected, and a big part of that is Mathew Barzal, and the Jordan Eberle acquistion. I’d imagine they will be in the hunt for a wildcard spot, maybe the 3rd metro spot. A Cup run would be tough, having to go through Pittsburgh, or Columbus, or Washington, and then Tampa as well. I’m not saying it’s a 0% chance, but it seems unlikely. This is a stretch given their standings right now. However, the Habs have the best goalie in the world who looks healthy now. Carey Price has been dynamite in the past few weeks. These guys are also near top of the league in shot shares, and the Atlantic is wide open for that 3rd spot. With Price on the team make playoffs and anything definitely is possible. The team isn’t very special in front of him however, and they will need a massive effort from Price if they want a cup this year. This is the other team very in the mix for the 3rd Atlantic spot. They are 6 points ahead of the next team, and have been dealing with injuries all year. Charlie McAvoy has been huge for them this season, and rookie contributions have helped too. When healthy, Brad Marchand, Patrice Bergeron, and David Pastrnak are 3 dominate players, and David Backes has been surprisingly good too. I’m not sure this team is a legit Cup contender. A big part of that is Tuukka Rask‘s play. However, this team has some great players up front. They should at least be close to playoffs, and will be a hard series for whoever gets them. These are the teams that would be pretty surprising if they miss the playoffs. These 5 teams all have the potential to win the cup. If any one of these teams was predicted by someone to win I don’t think you’d get too many crazy stares. This could go two ways. One: Toronto could shoot up to 2nd in this list if they get back to playing like they did last year and the start of this year. Two: they could stay right here. This is a Toronto team that is maybe the most talented forward group in the NHL. Frederik Andersen is a very good goalie who can steal them a bunch of games. The problems? Their defence is still not good. Pittsburgh showed last year you don’t need a #1 D to win, but having Crosby and Malkin kind of helps that. The other problem is the style of the Leafs play as of late. Now some think this is just a temporary thing. However, they have been dumping the puck in more, and ultimately being outshot, and out chanced almost every game. If this style of play keeps up there seems like a much smaller chance the leafs go far this post season. However, using this lineup to the best of it’s abilities could be deadly. Oh the poor poor Capitals.. Somehow back in 1st in the Metro even after losing a ton of depth. These guys are still talented that they could easily go on a run. Wouldn’t it be hilarious if the year after their “Must win season” they go all the way? It’s definitely possible with talent like Alex Ovechkin, Nicklas Backstrom, Evgeny Kuznetsov, and Braden Holtby. The Pens currently sit 1 point out of a playoff spot. Which makes them being #3 seem kind of crazy. However, I would still be shocked a team with Sidney Crosby, Evgeni Malkin, Kris Letang, Phil Kessel, and Matt Murray didn’t make playoffs. They had a rough start with a rough backup goalie. Crosby also had one of the worst stretches of his career. This team moving forward should be fine, and I’m not sleeping on a team that has 2 of the best 3 centres in the league. The 3-peat isn’t a certain thing, but it is possible. This is the team that has surprised me the most. I actually had them just missing playoffs because I extremely underrated them. They are a solid team front and back. In my top 5 for the league for odds of winning the cup. The Jackets have a few massive play driving guys, and a bunch of guys who fit anywhere in the lineup. Josh Anderson has been quite the player this year. Killing it in the advanced stats. The blue line looks solid, and Sergei Bobrovsky is amazing. This team has all the big pieces to win. A few good deadline additions and it could be very possible to see them lifting a cup. This shouldn’t come to a surprise to anyone. These guys have Steven Stamkos on their team, and he isn’t even the best player… Nikita Kucherov is a damn monster, and so underrated. He’s the 3rd best forward in the league. They have a loaded offence up front, followed by a great defence that can run Hedman, Stralman, and Sergachev on 3 different pairs. The goaltending is pretty solid too. This team has all the pieces to win, and then some. They are my favourites in the east, and in general to win the cup. I would not at all be shocked to see them lifting Lord Stanley in June. That’s my list! What do you agree or disagree with? Let me know here or on Twitter @NHLSensandStuff! Stay tuned later this week when I do the West!